- Take care not to scratch the interior trim or the body, or tear the seat covers. 1. Remove the headliner. (see page 20-140) 2. Disconnect the front drain tubes (A) and the rear drain tubes (B). 3. With an assistant holding the frame (A), remove the bolts (B, C) starting at the rear, and release the rear hooks (D) by moving the frame forward. 4. With the help of an assistant, carefully remove the frame through the front door opening. 5. Remove the kick panel. - 2-door (see step 5 on page 20-106) - 4-door (see step 5 on page 20-108) . 6. Passenger's side: Remove the stereo amplifier. 7. Detach the clip (A) securing the front drain tube (B). Pull out the front drain valve (C) of the body hole. Tie a string to the top end of the drain tube, then pull down the drain tube out of the A-pillar. Leave the string in the pillar to use when reinstalling the drain tube. -.2-door: Detach the clip (A) securing the rear drain tube (B). Pull out the rear drain valve (C) of the body hole. Tie a string to the top end of the rear drain tube, then pull down the drain tube out of the C-pillar. Leave the string in the pillar to use when reinstalling the drain tube. 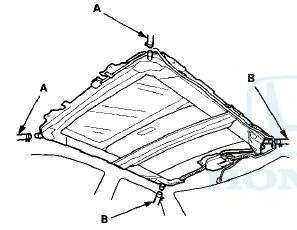 10.4-door: Pull out the rear drain valve (A) of the body hole. 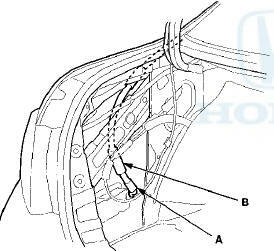 Tie a string to the top end of the rear drain tube (B), then pull down the drain tube out of the C-pillar. Leave the string in the pillar to use when reinstalling the drain tube. 11. Install the frame and the drain tube in the reverse order of removal, and note these items: - Before installing the frame, clear the drain tubes and the drain valves using compressed air. - To install a new drain tube, tie the string that was left in the pillar to the top end of the drain tube and pull it up into the roof. - Check the frame seals. - Clean the surface of the frame. - When installing the frame, first attach the rear hooks into the body holes. - Make sure the connectors are plugged in properly. - When connecting the drain tubes, slide them over the frame nozzles at least 10 mm (0.39 in). 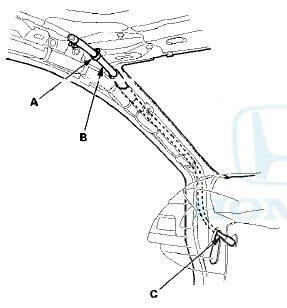 - Install the tube clips (A) on the drain tubes (B) as shown. 12. Check for water leaks (see step 9 on page 20-57). Let the water run freely from a hose without a nozzle. Do not use a high-pressure spray.